This stone is at the south-east corner of the Gaelic Chapel east graveyard. 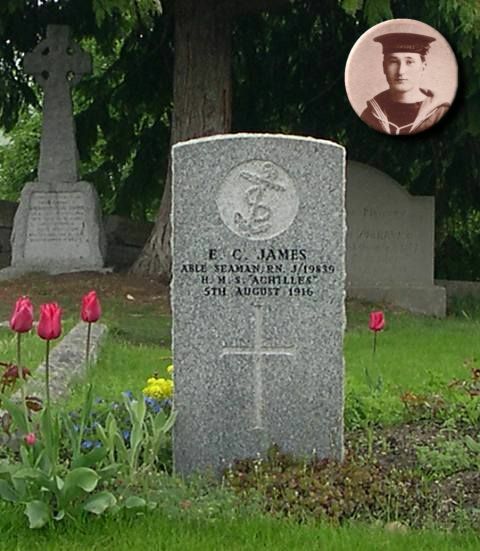 Thank you for pointing me in the direction of the image of my great uncle Ernest C James gravestone. It is good to know that the WW1 cemetary at Cromarty is well looked after. He was born on 11th February 1897 in Leyton, Essex and was 19 when he died at Cromarty. Here is an image of him wearing the cap ribbon of the land-based training ship HMS Pembroke. Thanks Andy, have added the photo to the main image.